Bardstown, KY (September 13, 2017) – The Bardstown Bourbon Company (“BBCo”) and Copper & Kings American Brandy Company (“C&K”) announced today the release of “Collabor&tion,” two distinct products made with 10-year-old straight bourbon whiskey – one finished in Copper & Kings’ American Brandy barrels and the other in Muscat Mistelle barrels for more than 18 months in the Copper & Kings basement maturation cellar. The project is intended to embody the spirit of friendship and partnership, and celebrates great craftsmen working together to produce exceptional products as kindred spirits. The bourbon used to produce Collabor&tion was distilled in Indiana in 2006 by Lawrenceburg Distillers, now MGP, and is made from 75% corn, 21% rye, and 4% malted barley. The Collabor&tion expression aged in Copper & Kings American brandy barrels is bottled at cask strength of 113 proof. The Mistelle barrel finish is bottled at cask strength at 94 proof. 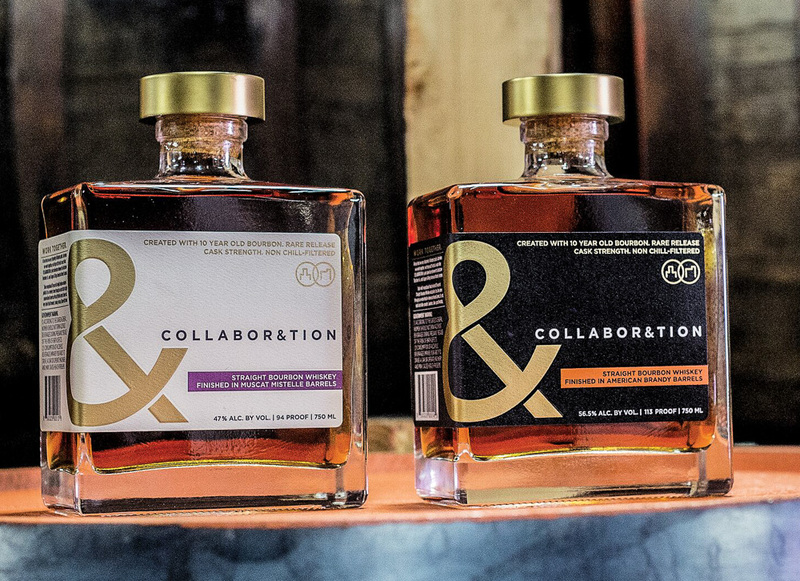 You can reserve your bottle of Collabor&tion below. Hopefully, there will still be enough bottles left to sell in the store once they actually arrive! Bardstown Bourbon Company "Collabor&tion – Brandy Barrel Finish" Cask Strength Bourbon Whiskey $124.99 (PRE-ORDER) - The Collaboration series is the first release of whiskey from Kentucky's soon-to-be star Bardstown Bourbon Company, a project done in "collaboration" with Louisville brandy specialists Copper & Kings. Using 10 year old stocks of Bourbon distilled at MGP in Indiana, BBCo finished each of the whiskies for an additional 18 months in two different types of casks: American brandy and Muscat Mistelle. Made from 75% corn, 21% rye, and 4% malted barley, the Collabor&tion expression aged in Copper & Kings American brandy barrels is bottled at cask strength of 113 proof and offers classic, yet bold Bourbon flavor with vanilla, oak spices, and a concentrated richness that speaks to the age of the whiskey. We tasted this on our initial visit to the distillery this past summer and instantly fell in love with the additional fruit and subtle sweetness added from the brandy barrel finishing. It has all the classic flavors of great Bourbon but with extra lift and roundness on the finish. In the spirit of collaboration, the teams at BBCo and Copper & Kings really knocked this one out of the park. NOTE: Due to the shape of the Collabor&ation bottle it cannot be consolidated with other bottles shipping and must ship in its own individual package. Bardstown Bourbon Company "Collabor&tion – Mistelle Barrel Finish" Cask Strength Bourbon Whiskey $124.99 (PRE-ORDER) - Made from 75% corn, 21% rye, and 4% malted barley, the Collabor&tion expression aged in Mistelle barrels has an incredible viscosity and chewiness to its texture from the time spent in the used casks. Mistelle is unfermented grape juice (in this case Muscat) fortified with un-aged brandy (Muscat eau-de-vie) and then aged in Bourbon barrels for 18 months. The empty barrels are deeply and highly caramelized with the grape sugars and fruit essences and the Collabor&tion whiskey aged in these barrels is pure joy. It's a completely novel sensory experience; deeply concentrated, rich whiskey that has a supple, fruity, and absolutely delicious finish. It's both an incredibly unique and divine tasting experience. Bottled at 47% cask strength ABV. NOTE: Due to the shape of the Collabor&ation bottle it cannot be consolidated with other bottles shipping and must ship in its own individual package.